Are you really transparent or just see through? We all know that trust, respect, integrity and service have been the go to values and behaviours for any successful workplace. However, in our new digital age, ‘Transparency’ has become the new “must do” value for workplaces and has become a critical requirement for leaders and teams to embrace as a 21st century way of behaving. What exactly is Transparency and what does it mean to be a Transparent Leader? In simple terms, transparency is about trust, where you are operating in a way that is open and easy for others to see what actions and behaviours are expected and acceptable. However, true transparency is very challenging, because it requires you to bring your authentic self to the table, which let’s face it, can be terrifying. Transparency requires you to be open to scrutiny and being somewhat vulnerable, which in itself, comes with a risk of being attacked and trolled by the cynics. In this article, I want to compel you to embrace transparency as a leader, share with you why transparency now trumps privacy and a simple transparency model. I will also provide you with some Proteus classroom case studies and argue why transparent leadership is the game changer for personal and organisational success. Typically, people fall into two camps when it comes to ‘sharing’ details and information. There are the traditional style of people who like being in control and only reveal details on their own terms or, there are the people who are happy to reveal all their intimate details to the world through an array of social media platforms. While both have valid reasons behind their willingness to share information, the reality is, transparency trumps privacy. Let me share with you why this is the case. We now live in a hyperconnected, digital, global world where everything can be observed. This is simply because we leave a traceable digital footprint everywhere we go, for all to access and see. This is not a moral or ethical comment, it’s a statement of observation with the implication that we need to consider how fully prepared we are to be transparent. The world now expects and in fact demands workplaces and the people who lead them to be totally transparent. Just in the last decade, billions of people globally have freely signed up and given away their privacy details to the likes of Facebook, Uber, Instagram, Siri, Google Assistant, Alexa etc, letting transparency (and let’s face it – convenience!) trump privacy to these digital platforms. There are of course extreme cases of transparency over privacy, such as Matthew Carney’s ABC exposé on China’s Social Credit system. In this example, facial tracking and recognition technology is used so that your every interaction is observed. This includes what you buy, who you associate with, where you travel and what you engage with on social media – all giving you social credit points! Top ‘Citizen Scores’ get VIP treatment and fast track you to the best universities, jobs etc. and ‘people at the bottom can be locked out of society and banned from travel or barred from getting credit or government jobs’. The genie is well and truly out of the bottle. 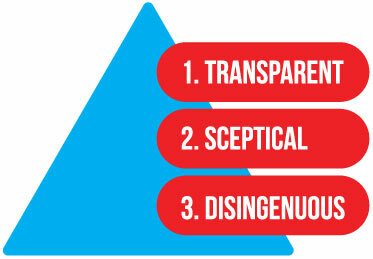 To get our heads around what transparent leadership is, I have created a model below that demonstrates firstly the essence of true transparency, secondly the sceptical leaders that sit in the middle and finally, what a disingenuous leader looks like (the complete opposite of transparent leadership). This is your authentic and genuine leader that is open, see through, easily perceived and are comfortable with being open to scrutiny as they have nothing to hide. They have integrity because their behaviours match their values and you can see this with their congruency in their body language. A Transparent Leader engenders trust. When you meet them, you are seeing the whole person and you ‘get them’ straight away, because there is no guessing and no assumptions required. You may not always like them or agree with their decisions, but you trust and respect them because you know where you and everyone stands. This is the guarded leader who is cautious and not yet prepared to present their true self. They are doubtful of options and strategies to move forward and question things excessively. They are not cynical, but they often ‘fence sit’ and make it challenging for things to progress and for people to be completely open with them. They are harder to read as they don’t fully reveal themselves and you often question where you stand with them. However, there is hope because the sceptical leader typically behaves this way because they have not fully evolved and need to work on becoming more self-actualised or we may not have created a psychologically safe workplace for them to be fully transparent. If it’s the latter, they are being guarded for self-protection and safety reasons not because they are negative or nasty. Most leaders move from being a transparent to a sceptical leader and vice-versa depending on the situation. The trick is to continually be working on becoming a predominately Transparent Leader and know when you are being too sceptical. However, we need to be careful of becoming stuck in the sceptical leadership style for too long where you stop being open or working on growing, developing and finding your true self, as you risk then becoming a Disingenuous Leader! This is the cynical person disguised as the charming leader that is ego driven, narcissistic and totally manipulative – even bordering on psychopathic! They hate being questioned or scrutinised and they lack integrity because their selfish behaviours are about short-term personal advantages, not about doing the right thing for the greater good. With the Disingenuous Leader, they resort to being coercive or using positional authority to get what they want and there is NO trust from their people, only fear or retribution. People who work with a disingenuous leader will often say that they don’t know where they stand with them, they are hard to read, and they are certainly not transparent, however once you realise their true identity and motives, they become totally transparent. Ironically, a disingenuous leader is a transparent leader but of the negative and destructive kind. The key thing to remember about a Disingenuous Leader is that they are not being genuinely transparent, they are ‘see through’! At Proteus, we have consciously designed our business to help organisations and their leaders to create robust positive cultures, radical honesty and bring their best authentic self to work. What we have realised over the twenty-five years that we have been doing this is that this can only be achieved if people are prepared to work on becoming a Transparent Leader. Our mantra at Proteus is to ‘Create Great Leaders’. What this means in practice is that through our various leadership programs, we work with our clients to help them reach their full potential and gradually become the best version of themselves as a leader. We give them specific tools, templates and concepts to enhance their leadership skills and capacity. What we don’t do is try and make people mimic certain celebrity or high-profile leaders, nor some out of date notion that leaders are only of a certain type i.e. charismatic, visionary and extraverted! Where the magic happens (essentially the science and art of great leadership programs) is when participants embrace who they genuinely are as a person and identify who they want to become as a leader in the future by being their authentic selves, while practicing and working on adding the skills, the thinking and behaviours required to be that future leader. This is Transparent Leadership in practice. In my educator role at Proteus, I have the privilege of working with hundreds of participants in our programs and I get to see ‘The Good, The Bad and The Ugly’ in the classroom and within their workplaces. When I decode their behaviours, I realise what I am seeing in front of me is the level of preparedness to be transparent or not. So, what does The Good, The Bad and The Ugly look like in the training room? Let me decode it for you and show you how it relates to the transparency model I discussed earlier. I love working with these leaders as they are open, authentic, inquisitive and non-cynical. They encourage and challenge each other and myself as a presenter, in a curious way. It’s a beautiful thing to see such genuineness with robust discussions and healthy disagreements. What we are seeing here in relation to the transparency model is a ‘Transparent Leader’ and what they do in this space is not try and be the best leader in the room but share the best version of themselves in the room by trying the new skills being taught all while being prepared to make mistakes and grow and learn from those mistakes. These are the smaller minority of sceptical leaders that are being closed off, defensive and showing indifference. They will be distracted and typically on their devices and/or walk out to ‘take a message’ at key challenging activities that require scrutiny and exposure. When you challenge them with an activity such as a roleplay, they will quip, ‘I don’t do roleplays’. In this situation, it isn’t that they don’t do roleplays, what they are really demonstrating is that they ‘don’t do vulnerability!’. What we are seeing here in relation to the transparency model is a ‘Sceptical Leader’ and what we need to do is either create a more psychologically safe training environment and/or, give them some extra space to grow and develop to become a more authentic true version of themselves. These are the rare few that are awful to have in the room. They can be outright vile and rude, but even more hideous, they often resort to using charming tactics that are a deliberate attempt to destroy the learning for everyone and the credibility of the program and presenter, all for their own ego. The tragic irony is that they think they are covering up their vulnerability by being overtly cynical and offensive, however the kicker is, when you know what to look for, they are totally see through! What we are seeing here in relation to the transparency model is a ‘Disingenuous Leader’ and what we need to do is call them on their behaviour and lessen the negative impact they have on the room and ensure that they don’t destroy the learning for everyone else as they grow into more Transparent Leaders. The Great, The Sad and The Odious! I decided to flip the traditional categories to ‘The Great, The Sad and The Odious’. When someone is being transparent and authentic and brings their best version of themselves to the room – it’s more than good, it’s GREAT. When someone just won’t open up and risk being transparent, it’s not really bad, it’s just a bit SAD really, what a missed opportunity for openness and growth for them and everyone else. When someone is using their disingenuous charm offensive to destroy the good will in the room, it is ODIOUS (which means extremely unpleasant, repulsive and causing or deserving hate). Enough said! Transparent Leadership, like public speaking, is a learned skill and is something you can get better at. It’s a muscle that you need to practice, practice and practice. As we say at Proteus, your leadership is demonstrated when you are speaking and every time you speak in public, you are auditioning for leadership. When we teach people public speaking skills, we need to acknowledge that speaking in public is rated as the most feared thing to do. The reason for this is that when we speak in front of a group, we are being exposed and we are terrified of being judged, rejected and being caught out as an imposter! The thing is, it is the same as Transparent Leadership because, like in public speaking, you are opening yourself up to exposure and being constantly judged. That is what Transparent Leadership is all about and why it’s not only a great challenge but also, an honour, privilege and the key to positive transformation. Remember, until you demonstrate trust, integrity and honesty through your behaviours, you cannot be truly transparent. Plus, if you’re not prepared to be open and transparent, people will see through you anyway. Tragically they will judge you on your worst traits, not your true character or potential. I believe anyone in a leadership position in our digital age, no longer has the option of staying in the stalls where you sit in judgement of everything around you and are critical and cynical. This is fake Disingenuous Leadership and will not survive long term. Leaders need to embrace transparency and get out of the stalls. Transparent Leadership is about getting into the arena, where you will be exposed, judged and at times rejected. Getting into the arena is not only the better option but I would argue the only transformational long-term option available to us if we want to discover our authentic, genuine beautiful selves – flaws and all. I want to leave you with this ‘Man in the Arena’ quote from Theodore Roosevelt that was inspired by watching Brené Brown’s famous 2012 TED Talk on vulnerability. In this TED Talk, Brown, who is one of my favourite authors, compels us that accepting our flaws is absolutely essential for success, growth and inclusion, where you have to show up and be your true authentic self. Richard Dore is the Managing Director of Proteus Leadership.